I like a sturdy cradle near my monitor when I work, allows me to easily operate the iPhone, and dock/undock with one hand, even with a case on the iPhone. In the photo below, note how some tan felt pads are used to cushion the phone. 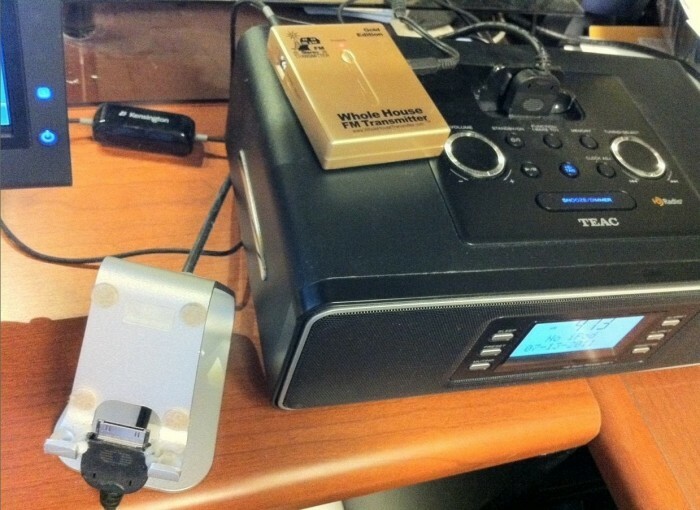 which is attached to this Teac HD-1 receiver's dock port. using this noise filtering cable by Kensington (to avoid hum) and the transmitter is left plugged in to AC power. When in another room, to pause music (say the phone rings), or to skip ahead or back in podcasts, I sometimes carry an Apple Bluetooth keyboard around to the room I'm listening remotely in, as a sort of giant remote control. It works great, up to about 35 feet away, using the standard F7/F8/F9 controls, with the eject button quickly toggling the iPhone's external/onscreen keyboard as needed. This set up gets me great audio near the Teac, and decent audio throughout my home, simply by sticking my iPhone in the cradle, even on the cheap radio near the shower. I've enjoyed this set up for years before Apple's Airplay feature made audio streaming more versatile (but still pricey). My exact version of the same company's FM transmitter is a bit older model, but similar specifications. Like any wireless technology, your results may vary.